Just arrived back home and of course - had to pick the winner from our BnW Blog Hop from those of you that were so kind to leave sweet comments on my blog post. Well - I wish I could pick each and one of you - but I left the decision to Random org. (Comments from my DT-sisters was not included in the draw). The lucky winner is Caz. Congratulations sweetie! Please send me your contact details! First of all - a HUGE thank you for all your sweet comments on my projects for the BnW and SCACD Blog hop earlier this week. Glad that you liked them. I will pick the winner from the BnW blog here tomorrow -so please come back then. Also - just a little tease - there will be more candy on my blog soon - yes....I'm getting one year older next week - so if you stay tuned - there will be some b'day candy up for grabs November 4th! Went for a rather clean layout - that you know that I love ;-) Just addded a few flowers and pink pearls. Hope you like it and I will check in tomorrow and also visit all of your sweet ladies blogs. Welcome to the release day and blog hop for the new artist Carmen Medlin - for SCACD. I got the honor to present the Teapot Mouse. Of course I thought of making something for tea and I found the perfect tutorial over at My Time Made Easy - the Tea Tabbed Box. I created the box first and picked out some warm fall colour DPs from my stash. Added a few flowers and leaves in matching colours and the gift set is ready to go. Hope you like it and I'm looking fwd to hear from you. You've completed the hop and I assume that you are on your way directly to the store to pick up these cuties. 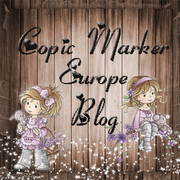 There will be prizes to win in this blog hop; coupons! There are a total of 5 coupons for 20% off Product only (one time use & shipping not included). Each of the store owners will randomly pick blogs and then randomly will pick the winner of the coupons the evening of the 29th. Winners names will appear on the store blog. So, you need to leave comments in order to participate;-). I also wanted to make sure that you don't miss the chance to enter for the SCACD candy over at the store blog and that you come back tomorrow when we are having the "New Artist for SCACD blog hop". Kramis and hope to hear from you tomorrow! 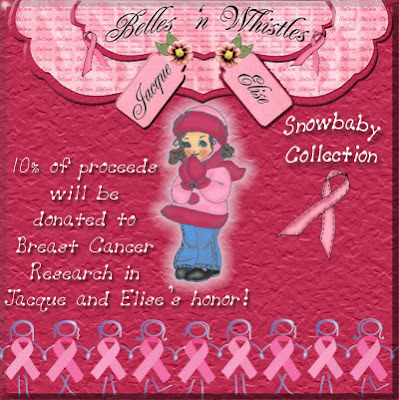 BnW Snowbaby Collection Blog Hop!! Welcome to the BnW Snowbaby Collection Blog Hop! I also would like to tell you that Summer will donate 10% of the new release sales for the first month (October 27-November 27) to Breast Cancer research in honor of our sweet DT-sister Elise's and Jacque's names. For those of you that would like to spread the word of this good cause - please feel free to grab the tag (see the side bar) and put it up on your blog as well. 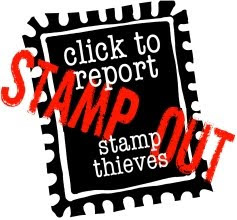 Make sure that you take the time to comment on each project - because who knows - maybe you will be the lucky winner of the stamp showcased. Each DT member will pick one lucky winner of the stamp showncased on each personal blog. Also remember to read all the details on the BnW blog and leave your little mark there as well - since one lucky winner (picked randomly) from the BnW Blog will receive the whole kit. Good luck ladies - and hope you enjoy the blog hop! I got the honor to present Snowfight. I coloured her with my copics and picked up some lovely DPs from our local craft shop Pysselakuten. The sentiment God Jul = Merry X-mas in Swedish is actually from the DP. Added a few snowflakes as well. I wasn't sure on what to make as my "Hot Drink" to go with the card. Then I purchased the "Fancy a Cuppa?" tutorial over at My Time Made Easy and the idea was born - I wanted to make "Snowman soup To Go-kit" ;-). So I altered some "To-Go-cups" with the matching DPs. Added snowflakes and the Snowman face from the "Peek-a-boo" stamp. Hope you like it and before you leave - would love to hear what you think - so please take the time to leave a comment. Then it's time for you to pop over to Kathy's blog to see what she's been up to! It's time for a new challenge over at BnW - hosted by our supersweet Gini. She wanted to see trick or treat on our projects and no - no Halloween theme - instead a trick on our cards or maybe a treat. I decided to alter a brown gift bag and use some X-mas DPs that I got from my local craft shop - Pysselakuten. Coloured Teddy, Puppy and Doll with my copics. Used my SU punches to cut them out. Nope - Woody ;-)) Isac love Toy Story3. Hope you like it and make sure that you check out the rest of the DTs projects! Also - make sure that you come back on Wednesday and join us for our Blog Hop - YES - new BnW cuties on their way!!! New release, new artist and candy over at SCACD!! Just a little note from me - so that you don't miss the upcoming release for the very new artist over at SCACD. We will have the blog hop October 29th - but as always - Susana is having a blog candy. So pop over to the store blog and enter. I just wanted to show you a little card that I made at our local scrapevent "Vänerscrappen" that we had last weekend. They had a challenge where we should use minimum 3 items that was in the welcome gift-bag. The three pieces from the welcome gift-bag are roses (but I coloured them darker with my copics), brad and the little angel charm. Hope you like it and have a wonderful Friday! DP from SU as well as the ribbon. Sentiment from my sweet friend Kathy. Flowers from stash and the little butterfly is from our local craft shop Pysselakuten. Here's a pic of the lid. And here's a pic of the whole box from the side. It's TIOT time again and of course there's a fab sketch from Suzanne to play with in October as well as you can see below. I coloured Little Acorn with my copics. Cut her out with my nestie. Added a few matching brads and flowers. DP from my stash. Isn't she a cutie? Looking fwd to hear from you! How has your weekend been? Ours have been great! The weather has been wonderful as well - sunshine, we've had minu 4-5 C in the morning, the air has been clear and crisp. So I've had a lot of good energy this weekend. We even managed to store all our outdoor furnitures and getting the garden ready for winter. All this energy and Fall colours have really made me create a lot of cards with the yellow, orange and warm green colours lately. And yes - I have a few more to show you :-)) One of them is with one of my top favourite BnW stamps - "Tania baking". Coloured her with my copics, DP from SU and added flowers, leaves and Prima flower centers. Looking fwd to hear what you did on your weekend!! Kramis and have a fab Monday everyone! Just a quick post from me today - since I'm getting ready for the Scrapevent Vänerscrappen that takes place in my hometown Vänersborg tomorrow. We will create between 10-22 and get served with snacks, lunch, candy, dinner - well a full day where we can only focus on our creations. Always so much fun! Just wanted to show you this other designer hand-bag that I made after a tutorial from Becky. 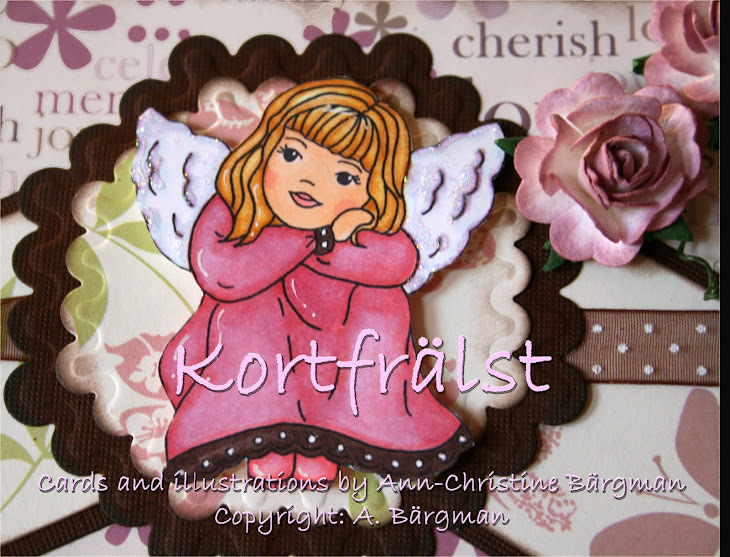 The Cardstock, Brads and Metallic flower are all from our local craft shop Pysselakuten. Have you - like I - difficulties in finding the right storage supplies for your crafting tools? Well - here in Sweden the storage is sooo expensive - so I decided to at least give it a try and make a mini-cabinet myself. I purchased the tutorial from the very talented Becky. DP and lace from my local craft shop Pysselakuten. Stickles, Smooch, Glitter, Brads and Flock - all from Susana's Custom Art and Card Design. Make sure that you pop over - since she has tons of new "MUST HAVE" Products. 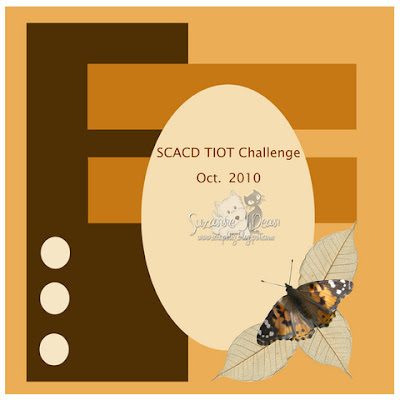 Today's TIOT challenge is to create a "fun FALL themed GIFT and use some fun embellishments like chipboard, pearls, etc. I decided to colour Little Sprite with my copics and made a little mini-card. And then I made a little handbag (template from Becky) and a wallet to put in money, gift vouchers - or anything that you would like to give away. Added chipboards on the bag and the wallet after I had glued on some matching DP and chalked the edges. The pearls are made with my Viva Decor Pen. Here's a pic of how the wallet look on the inside. I close it with a piece of velcro underneath the brad. Hope you like it and would like to play with us! New BnW Challenge and New BnW Challenge Blog! The new challenge is hosted by our wonderful Jodi and she challenged us to use Fall Colours. Well - I think Fall Colours are on my favourite list of colours. What about you? I coloured Every Belle with my copics. I think she's adorable and she so much reminds me of Cinderella - before she found her Prince - don't you agree? DP from SU, Pearls created with my Viva Decor Pen, Flowers and leaves from my stash, Sentiment sent to me from supersweet Tammi! Kramis and hope that you will join us for the fun! No card to show you today - but some pics from the wedding that we attended today. It was hubby's sister Anna that got married to her Magnus (they have been together for 19 years and have 3 wonderful sons). Have a great Sunday everyone and see you tomorrow again! Are you having any nice plans for this weekend? I'm going out tomorrow with my sister's and my cousin Helené (she is almost like a sister to me) to Ladies Night in Gothenburg. It's a show for ladies only with great Swedish male artists - well - one of them is def. also someone that you could just enjoy looking at ;-) So it's going to be a lot of fun. Then we are attending a wedding on Sunday - can't tell you for who yet - since it's supposed to be a secret. Well - talking about fun - I love this cute little image and it looks like she's having a lot of fun just pretending to be all grown up - having a tea party. Hope you like her and have a wonderful weekend everyone!